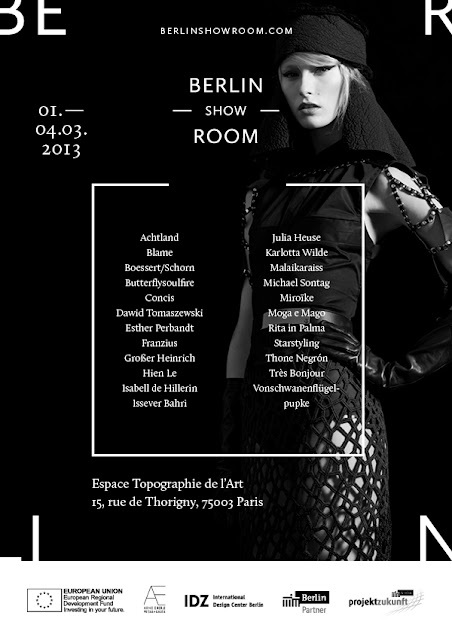 This season the Berlin Showroom will open its doors for the first time in Paris during Women's Fashion Week. It will be located in the heart of Paris, the Marais. 23 carefully selected designers, internationally renowned ones as well as aspiring newcomers will present their fall/winter 2013 collections there. The showroom is a strategic element of the foreign economics promotion of the federal state of Berlin and the affiliated program "Neue Märkte erschließen" and is co-funded by the European Union. Berlin Showroom presents the following designer labels: Achtland, Blame, Boessert/Schorn, Butterflysoulfire, Concis, Dawid Tomaszewski, Esther Perbandt, Franzius, Großer Heinrich, Hien Le, Isabell de Hillerin, Issever Bahri, Julia Heuse, Karlotta Wilde, Malaika Raiss, Michael Sontag, Miroïke, Moga e Mago, Rita in Palma, Starstyling, Thone Negrón, Très Bonjour and Vonschwanenflügelpupke.